"The easement to build the unsafe Dakota Access Pipeline has not been granted. 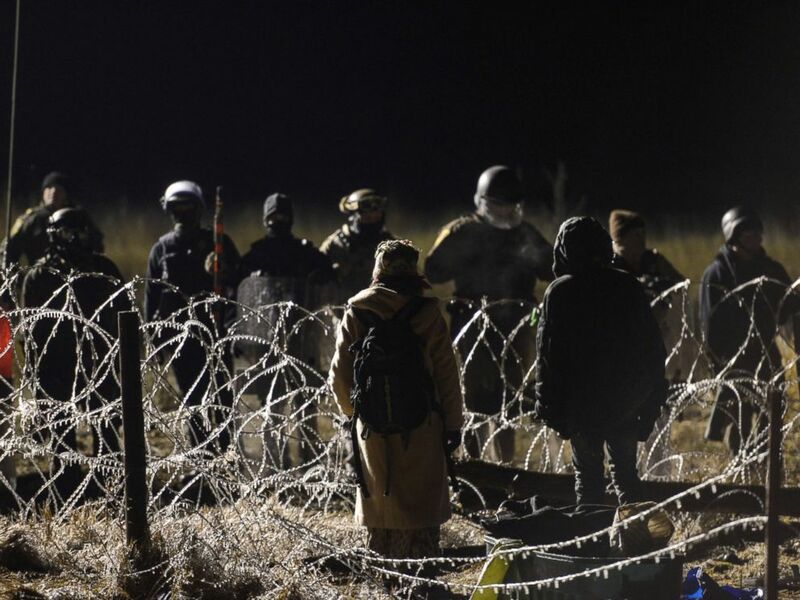 But under the cover of darkness, North Dakota law enforcement continues to engage in unlawful and dehumanizing tactics to subdue peaceful water protectors with tear gas and water cannons," Dave Archambault II, the chairman of the Standing Rock Sioux Tribe, said in a statement today. "Live video footage on Facebook this Sunday night (Nov. 20) clearly document that North Dakota's law enforcement and government officials have sanctioned aggressive acts in failed attempts to disperse water protectors who have the right to demonstrate against and report on this failing project. It's time for President Obama to condemn these tactics and this pipeline. "Our culture, our children and our homelands have repeatedly been stolen from us," Archambault added. "We are deeply saddened that despite the millions of Americans and allies around the world who are standing with us at Standing Rock, a single corporate bully — backed by U.S. government taxpayer dollars through a militarized law enforcement — continue[s] to be sanctioned by aggressive, unlawful acts. President Obama, this cannot be your legacy." The clash on Sunday took place after demonstrators gathered on the Backwater Bridge, north of a protest camp in Morton County, according to authorities. About 400 people attempted to breach a law enforcement blockade on the bridge to go north on Highway 1806. The Morton County Sheriff's Department described it as a "riot." The standoff at the bridge comes after months of tension between law enforcement and demonstrators who are pushing to block construction of the four-state Dakota Access Pipeline, which the Standing Rock Sioux Tribe says threatens its water supply and traverses sacred sites. The company building the pipeline has argued that these claims are unfounded. Authorities defended Sunday's response to the demonstrators today, saying that "water hoses" were used, not water cannons. "That is something we are trying to debunk," Rob Keller, a spokesman for the Morton County Sheriff's Department, told ABC News. He said that the fire department was called to the site of the protest, where hoses were used to put out fires that had been started and "to control the aggressive actions of the protesters as they approached the law enforcement line." Keller confirmed that tear gas and rubber bullets were used on protesters on Sunday. He added that he could not confirm the number of protesters injured because no injuries were reported to police, though he did say that one police officer was hit with a rock. "This is not a legal, peaceful event," he said. One of the estimated 400 protesters was arrested, he said. The American Red Cross is providing shelter and resources to the Standing Rock Sioux Tribe in Fort Yates, he added. Protesters stand off with police during a protest against plans to pass the Dakota Access pipeline near the Standing Rock Indian Reservation, North Dakota, Nov. 20, 2016. Dallas Goldtooth of the Indigenous Environmental Network told ABC News today that 160 people were injured and that of those, 17 had to be hospitalized. He said that the people who had to be hospitalized mostly suffered from "head injuries from the rubber bullets" and that "there was one individual who had a heart attack, who went into cardiac arrest." He said they also saw "two cases of hypothermia or early stage hypothermia." "We saw a lot of respiratory issues because the water was mixing with the tear gas," Goldtooth added. The standoff occurred over a police barricade that was put up on a public highway, blocking off about 8 miles of the highway, he said. "At this moment the only people allowed between that swath of road and land are Dakota Access and law enforcement," he added. "The police and National Guard are basically blocking off an 8-mile swath of a public road for a private oil company." Goldtooth said today the demonstrators are taking care of the injured who weren't hospitalized. "Right now, we are putting our attention to make sure our people are safe and making sure all injuries are being taken care of," he said. "We haven't gone into discussions of what's going to come next." Margaret Huang, the U.S. executive director of the advocacy group Amnesty International, wrote a letter to the Morton County Sheriff's Department in response to video footage of last night's clash. "The use of those water cannons against the protesters themselves risks potential injury and hypothermia for the protesters who were sprayed with water in below freezing temperatures. Also alarming are videos of the use of tear gas and reports of rubber bullets used to disperse the crowd of protesters," her letter states. "Any use of force — such as the water cannons, tear gas and rubber bullets — by law enforcement officers must be necessary and proportionate to the threat posed." Amnesty International announced today that it will be sending another delegation of human rights observers — its fourth — to monitor the protests. 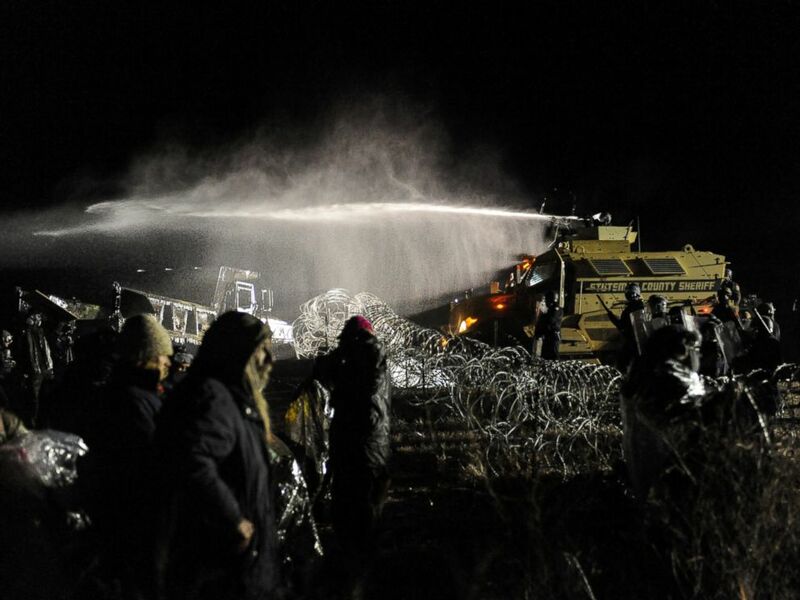 Police use a water cannon on protesters during a protest against plans to pass the Dakota Access pipeline near the Standing Rock Indian Reservation, North Dakota, Nov. 20, 2016. "Standing Rock is the moral center of the nation right now; the real question is why there's no response from the White House to [the] kind of abuses that would make us protest loudly if they happened abroad," prominent environmental activist Bill McKibben said in a statement. "This is America's oldest shame, and it's sad that we're still seeing it in the waning days of the Obama presidency."